The Costa del Sol is a very pleasant place to be on a holiday! Infinite entertainments, beautiful landscapes, royal cultural heritages, amazing beaches and celestial food. Before you continue reading take a tasty drink and start being in a holiday mood. The Costa del Sol will give you a summer feeling with temperatures around the 30 degrees. When the Sahara de Terral (a Föhn wind) blows on the country, temperatures can even get till 40 degrees or more. But don’t panic, it’s not every day is like this! The Costa del Sol is perfect for every holiday maker, so it’s also ideal for you! Take your beach towel and relax on one of the beaches in the Costa del Sol. Sail on the Mediterranean Sea. Have a city trip to one of the fascinating cities in the Costa del Sol, like Málaga. Or explore the inlands with its idyllic and authentic villages. And what about the winter? In the middle of a sunny coast, like the Costa del Sol, you can also find winter sports in the Sierra Nevada mountain chain. While you discover some of the places on the Costa del Sol, you’ll get even more inspired to have an adventurous holiday. Continue reading to feel the appeal of the Costa del Sol! Click here and find your villa in the sun! The Costa del Sol is one of the most famous coasts in Spain, just like the Costa Brava, the Costa del Maresme, the Costa Blanca or the Costa Dorada. You’ll find the Costa del Sol in the provinces of Málaga, Cádiz and Granada. Sotogrande or Almería will probably sound unfamiliar to you. But besides these two less known fairy tale towns on the Costa del Sol, you’ll find very popular coastal villages like Benalmádena and Torremolinos. Another example is Marbella, which is famous because of its red carpet where many famous stars show up and because of its picturesque old town centre. Do you hate rain? Then, the Costa del Sol is absolutely the perfect place for you! The only season of the year when it rains sometimes is from October till April. Discover something new every day on the Costa del Sol without getting wet. Let you be seduced by the charms and the peaceful landscape of the Costa del Sol and discover the amazing inlands. The Laguna de la Fuente de Piedra will immediately catch your attention. It’s the biggest lake of Andalusia and it’s always full of flamingos. The Costa del Sol offers you so many. The nature park Sierra Tejada, the Parque Natural de los Acantilados de Maro-Cerro Gordo, the Sierra de las Nieves, the Montes de Málaga and the Torcal Natural area, just to mention some of them. Besides all these, 2 other eye catchers that you can’t miss are the botanical gardens and the glorious caves of Nerja. This very unique nature park on the Costa del Sol is composed by an impressive mountain chain, whose tops are surrounded by a layer of perennial clouds. More than 40.000 ha are waiting for you to have a very special walk between the diversity of flora and fauna. One thing is for sure, you won’t get bored! The fascinating nature reserve los Alcornocales in the Costa del Sol is the biggest and the best preserved cork oak forest in Spain. On the coast of Maro-Cerro Gordo, you’ll get in a tropical atmosphere! You’ll pass small rocky bays and some sandy beaches. The woody paths will lead you to the next discovering on the Costa del Sol. A photo shoot is waiting for you and, when the weather is good, you’ll even enjoy a view of the African coast on the background. The most valuable ecological nature parkof the Costa del Sol protects several animal species threatened by extinction. It will be a visit that you won’t forget. Montes de Málaga is a magnificent mountainous areaat the Costa del Sol. You’ll find a wide range of flora and fauna, with every once in a while a hidden house. The imaginative rock formations are very impressive, which makes the Costa del Sol the most characteristic landscapeof Europe. Every part is special because of the erosion made by the rain and the wind. Our strongest recommendation is to visit the Torcal Alto. There, you’ll be rewarded with beautiful sights of Malaga’s province and, sometimes, even of the African coast. Do you want to stretch your legs? Follow the “green route” and admire the local fauna and all kinds of vegetation. Follow your own route or the recommended one through this amazing botanical garden. At the entrance, you’ll get a map of the park and you’ll be ready to start the exploration of this historical garden. While you do this, you’ll walk between palm trees, vines and many other exotic plants. In another of the areas in the garden, you’ll travel around the 5 continents. This is literally diversity per square meter! This isn’t just a regular stalactites cave on the Costa del Sol. Have a walk through the corridors and chambers and feel imposed by the 150.000 m2 of stalactites and cave drawings. During the break, kids will have fun at the playground and you’ll be able to enjoy a picnic. In July, a very special event takes place there: the International Music and Dance Festival. Even if Benalmádena, Fuengirola, Marbella, Mijas, Nerja and Torremolinos attract mass tourism, there still have some romantic places. Discover the unknown of the most popular coastal villages, with the most comfortable facilities of the Costa del Sol. In Benalmádena, there’s a typical Andalusian cheerful atmosphere. In Benalmádena Pueblo, there’s an enormous and impressive castle. “Castillo de Colomares” has an exotic fairy tale look and gives the impression to be really old. But appearances are deceptive. This fairy tale castle was built in 1994 as a memorial to Columbus. The harbour’s area is the ideal place for people who enjoy shopping or going to restaurants with a high standard.Combine Benalmádena with Fuengirola. You’ll find daily boats and ferries (many times a day). Animal lovers, come to the Biopark, which is in the middle of Fuengirola. In the authentic Moorish castle “Sohail”, you’ll get into a medieval atmosphere, especially when actors in original clothing play live performances. Also the kilometres long shopping streets and shopping centres are a true pleasure to fanatic shoppers. The heart of the Costa del Sol is the bobo’s world. From the centre of Marbella till Puerto Banus, you’ll find “glitter and glamour” everywhere. The Golden Mile is the Broadway of luxury houses. Before Marbella became famous because of its jet set and yacht harbours, it was a calm and rural village. The rural area of Marbella proves this. There, you’ll find the Moorish defensive walls, small houses at the Plaza de los Naranjosand a maze of small alleys. Dalí lovers, you’ll certainly have to visit the Avenida del Mar, between the park Almeda and the boulevard, because there are several Dalí paintings there. This picturesque white village on the Costa del Sol is formed by 5 city centres: Mijas Pueblo, las Lagunas, la Cala, Riviera and Calahonda. In Mijas Pueblo, it’s as if the time had stopped. And if you want to experience a unique moment in your holiday take the donkey taxi! Mijas has also innovative and luxurious golf and spa resorts and one of them, by the way, is the biggest golf resort of Europe, “La Cala Golf”. There are so many high lights to visit. The Ermita de la Virgen de la Peña, a chapel made on the rocks, where there’s a museum of the locals history. The bull fighting arena, which is not as beautiful and big as the one in Ronda, but has amazing sights of Mijas. And, finally, you’ll find another beautiful view from the watch tower Torreón de la Cala. The most centric point of Nerja is not a square or a church, but an emerging rock on the coast. The famous world-over Balcony of Europe is at the end of the promenade. You’ll be surrounded by palm trees, a mountainious landscape behind you and the cliffs and bays. After having a moment to take pictures, you can walk back to the cheerful and small streets. Finally, you can pass through the Cuevas de Nerja or Pago del Castillo Alto. It’s thanks to the Moorish tower, Torre de Molinos, from the 14th century, that Torremolinos is on the map today. This place is nowadays very touristic. Next to the 6 km long beach, at the boulevard, you’ll find many bars, snack bars, restaurants and shops. Attention if you like eating fish! At the fisher’s quarters, Carihuela, there are many fish restaurants where you can hang out during the evening. At the Plaza de la Gamba Alegre, you’ll find a tattoo museum. The Costa del Sol has many typical and still virginal villages, just as many cities that also have preserved their purity. It’s very joyful to see the different historical influences in Antequera, Estepona, Granada, Málaga, Ronda and Torrox. In this area of the Costa del Sol, you’ll find many chapters of history preserved. Antequera will impress you with its beautiful baroque architecture, the rest of the Moorish defence walls and towers. Just outside the village, there are three dolmens, megaliths and the rock of love, “Peña de los Enamorados”.The legend is, by the way, less romantic as it sounds. Estepona has, since the 2nd half of the 20th century, massively grown in tourism. Nevertheless, the old village centre has remained unaffected and the fishing auction at the harbour has been preserved. An important historical heritage is the 18th century church “la Virgen de los Remedios”. Just as the 15th century “Torre del Reloj”, which was completely restored during the 19th century. The old bull fighting arena of Estepona is brilliant. Meanwhile, the bull fighting and matadors have stopped in this arena, but there’s a museum of it in front of the town council. The Moorish student city, together with its Alhambra, is a very fascinating holiday destination. The originally Jewish village was, from the 11th century till 1492, occupied by the Arabs. You’ll find remains of this in the Barrio de Albayzin. The Catholicism is represented by Granada’s 16th century cathedral and its jewel the “Capilla Real”. You’ll also find the graves of the King Fernando and the Queen Isabel, next to the ones from the King Felipe and the Queen Juana. Peña de Los Enamorados.This "stone giant" that took place many legends recall. The impressive Málaga —the capital of the province named the same on the Costa del Sol— is the place of birth of one of the most influential painters of the 20th century, Pablo Picasso. Málaga is also very popular because it’s one of the most important cities with harbour in Spain. Besides this, Málaga is a modern Mediterranean city that welcomes tourism and it’s an unlimited inspiration source. From the Plaza de la Marina, you can walk from the Calle Larios till the Plaza de la Constitución. This car-free street is decorated with flowers and plants, elegant street lights and all kinds of artistic objects. In the alleyways, you’ll find many shops and places to eat, like for example typical Spanish tapas bars. Málaga’s cathedral and fort are absolutely worth a visit. The cathedral was built on the base of the Mezquita Aljama. Because the building lasted more or less two centuries, you’ll see many different construction styles on it. Spain has suffered many wars during its history. At the foot of the Gibralfaro hill, there’s a 11th Moorish fort called Acazaba. Above it, there’s a beautifully designed garden and the museum of the Gibralfaro castle. Take a well filled wallet and make sure that you have enough space in your suitcase because it’s shopping time! There are so many clothes, accessories and shoes shops. Start at the Calle Marqués de Larios. Haven’t you found what you’re looking for? Don’t worry, the shopping centre and the big department stores offer you a wide choice. CAC Málaga (Centro de Arte Contemporáneo de Málaga): architectural museum. Málaga CF – La Rosaleda: football stadium and museum. Museo del Grabado Español Contemporáneo: art works from Tàpies, Miró, Picasso, Chillida and library. Museo del Vino Málaga: Wine museum. The most important high lights of the Costa del Sol in Ronda are the bull fighting arena and the Puente Nuevo. Ronda’s bull fighting arena is one of the oldest in Spain that’s still work. This architectural arena is used as background decoration during the festivities (in the first week of September). The Río Guadalevín divides Ronda in two parts. You’ll find three bridges that connect the Moorish village “La Ciudad” with the new area called “El Mercadillo”. When we say the second area is new, it’s quite relative because it has existed since the 16th century. Ronda has also been a victim of the Arabs and bandits. The result of this is the 13th century Arabic baths at the Puente Árabe and the Museo del Bandolero. A century later, the Palacio de Mondragónwas built, which nowadays you’ll find as the history museum of Ronda. The best climate in Europe is, as they say, in Torrox. Experience it by yourself when you lie on its beach, when you have a walk along the wide boulevard of Torrox Costa or when you visiti Torrox Pueblo. The village centre area is very cheerful and interesting thanks to its 16th century Iglesia de la Encaranción and the Ermita de Nuestras Señoras de las Nieves, which was founded by monks in the 18th century. The sun shines and it’s pleasantly warm. What are you going to do? The list of activities on the Costa del Sol is infinite. All the ingredients to have a family day are here: water parks and playgrounds, amusement parks and animal parks, where you can also have a relaxing moment. If you have a lot of energy go to the Alhambra! And if you’re looking for more action, you’ll discover that the Costa del Sol is full of entertaining places. Aquapark – Mijas, water park. Aqualland – Torremolinos, water park. Funny Beach – Marbella, with a kart track and trampolines. Lobopark – Antequera, a wolves reserve with a farm for kids. Mariposario de Benalmádena – Benalmádena, butterfly farm. Selwo Aventura – Esteponau, zoo and safari park. Teleforico – Benalmádena, in 15 minutes by cableway to the top of the mount “Monte Calamorro”. Get spoiled and have a rest in some baths or in a spa & wellness centre on the Costa del Sol. The geothermal baths have different kinds of water temperatures. Don’t forget to ask for information about the different functions of the water. Most of the spa & wellness centres are in Benalmádena, Marbella and Mijas. Do you fancy authentic Moorish baths? Come to the beautiful Sierra Nevada! The best place to go is Granada’s Alhambra; next to the baths, the Arabic al-Kasr al-Hamra has a unique collection of palaces and impressive gardens full of flowers and fountains. Get to know the sportive side of the Costa del Sol! The amount of the outdoor activities is enormous. In other words, you can try something different every day. There are several mountainous areas that give you the opportunity to climb. You’ll need some guts, but you’ll get to the most beautiful places, which you wouldn’t see in another way. Have a walk in the mountains, hike through the green paradise of Montes de Málaga or jump on the back of one of the Andalusian horses to have a ride. More suggestions? Train your legs on a mountain bike or hit a ball on a golf course. Especially for water lovers, many coastal villages on the Costa del Sol offer all kinds of water sports. If you want speed and you want to test your stability, try water ski. So, for you and all the others fun is guaranteed. The coastal area of La Herradura (in Almuñécar) and Cabo de Gata are paradisesto divers! Which is the easiest way to get to the best places on the Costa del Sol? And where can you find this information? In cities as Cadiz, Granada, Málaga and Sevilla, you’ll find Hop-on Hop-off buses. You’ll see the high lights comfortable and fast. Local travel agencies organize many trips: from active till cultural / historical. Usually, cities like Córdoba, Granada, Málaga, Mijas, Nerja or Sevilla are on the list of excursions, just as the fascinating inland of the Costa de Sol. If you go to this trip, you’ll be visiting different authentic and traditional villages. With many chances to taste the local dishes! It’s not unique, but it’s very special! Experience a lot of fun as a chocolate freak! And what about the kids? They’ll have a great time, in the small chocolate factory “Mayan Monkey Mijas”. There, you can make your own chocolate bars and taste the most incredible types of chocolate. You can experience another spectacular day, in the Costa del Sol, if you go on an air balloon trip above Granada or Ronda. The Costa del Sol is a real discovery! Especially, if you take the buggy, bike, jeep or quad safari. Some of the most beautiful areas are Benahavis and Marbella and some of the many nature reserves or mountainous areas, in which the Costa del Sol is so rich. The Costa del Sol is full of bays and beaches. Not all the beaches are easy to find. Playa del Molino de Papel, Playa de las Alberquillas and Playa del Cañuelo are not on the map, which makes them more attractive. These beaches that are not indicated might be full of pebbles. Let you be surprised or go to the Tourism Office, “la Oficina de Turismo”. Almuñécar – San Cristóbal (pebble beach), El Altillo, Puerta del Mar (sandy beach), Vellila, El Tesorillo and La Herradura are all worth a visit. Benalmádena – Benalmádena Costa has a beautiful sandy beach of 9 kilometres long. Estepona – The beaches of La Reda and El Cristo are more or less 4 kilometres long. The sun stays the longest here and its water is the warmest of the Costa del Sol. Besides this, there are many chiringuitos (beach bars), bay watchers and showers. Also El Padrón, El Castor, Puerto de Plata, Chullera and Salada Vieja have fine sand and clear water. Playa Galera – Only visited by the locals. Fuengirola – The best beaches are Las Gaviotas, San Francisco, Santa Amalia and Los Boliches. They’re also ideal places to fish boquerones, sardines en sea breams. Málaga – Málaga has many nearby beaches, like: Balneario del Carmen, El Palo, Acacias, Pedregalejo, el Chanquete and San Andrés. The small bay, Capobino, is one of the only places without high buildings, but it has water sport facilities and restaurants. Marbella – A wide range of options in more than 28 km. The best beaches are: the 8 km long beach, las Chapas, el Ancón, la Fontanilla, el Fuerte, los Monteros, Río Real, Río Verde, los Cármenes and el Rodeo. Nerja – High quality beaches and many beach restaurants. You’ll find turquoise water in the following beaches: Playazo, Burriana, Caraveo, el Chorrillo, Calahonda and el Salón. Sotogrande – Sotogrande has long beaches with on their background grass-covered hills. Torremolinos – At one side of the rock, there are beaches like El Lido and El Bajondillo, and at the other side, El Carihuela en Montemar. 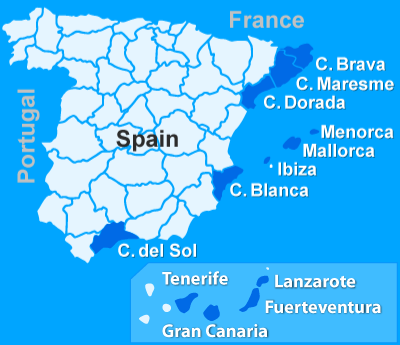 Torrox– Torrox has many beaches, such as: Calaceite, Morche and El Faro. The so-called Blue Flag beaches have a great quality of waters and many facilities. The Costa del Sol has such beaches as, for example: Adram, Almería, Benalmádena, Estepona, Marbella, Mijas, Nerja, Torrox and Velez. Everywhere in the Costa del Sol, you’ll find nice bars with a typical Spanish atmosphere. Andalusia is famous because of its chiringuitos (beach bars). The most popular nightlife is in Benalmádena (on the Plaza Sol y Mar), in Marbella (at the Puerto Banus) and in Torremolinos. Do you want to experience something typical Spanish? Travel to Torremolinos and go to the Plaza de la Gamba Alegre. Every summer, in the high season, you’ll find some great flamenco shows(four times per evening). You’ll experience the Spanish life on the Costa del Sol at the markets. Meet nice people and try the local delicatessen. Haven’t you already bought a souvenir? Here, you’ll certainly find something characteristic of the Costa del Sol. Look here, when and where you’ll find the markets. Almunecar – On the first Saturday of the month, there’s a flea market. Benalmádena – On Fridays, the weekly market (in Arroyo de la Miel), on Wednesdays the flea market (in La Paloma). Estépona – On Wednesdays (in the village centre) and on Sundays (at the harbour). La Herradura en Almunecar – On Fridays. Málaga – From Monday till Friday, there’s a 19th century market (with vegetables, fruit, fish and meat). Marbella – On Mondays (at the Recinto Ferial), on Thursdays (at the Avda. Jorge Guillén), on Fridays (at Las Chapas) and on Saturdays (along the boulevard van Puerto Banus). Mijas – On Wednesdays (at the Recinto Ferial). Nerja – On Tuesdays (in Almijara) and, on Sundays, there’s a flea market (in Almijara). Torremolinos – On Thursdays (at the Recinto Ferial) and, on Sundays, there’s a flea market (also at the Recinto Ferial). Torrox – On Mondays (along the way from Torrox Costa to Torrox Pueblo). The Costa del Sol celebrates national and regional events. Festivals create a cheerful atmosphere. Let you be absorbed by the rhythmical tunes, the colourful clothing and the erratic dances of the Costa del Sol. Just as on the Costa Brava and the Costa del Maresme, the Semana Santa (the Easter holidays) is enthusiastically celebrated on the Costa del Sol. In Benalmádena and Málaga, they major event is the Corpus Christi. In Torremolinos, Fuengirola and Marbella, you’ll get in a festival mood during the Virgen del Carmen. In the end of June / the beginning of July, there’s a big music and dance festival called Festival de Música y Danza. The best flamenco singers perform in the end of August during a typical Andalusian festival. During the Festival del Cante Grande, in Ronda, many singers battle for the title of best flamenco singer. After August, there’s still more party in the cities. The first week of September there’s a big party called the Feria de Pedro Romero, in Ronda, with the Corrida Goyesca. The matadors, as well as the people, wear traditional clothes. You’ll enjoy a colourful city full of loud music, where people dance and sing happily. All this, of course, with local delicatessen and wine. The Costa del Sol is easy and fast to reach. You can take the plane to Málaga or Granada or have and adventurous trip by bus or train. The price is probably not cheaper, but another option is to go by car and stop whenever and wherever you want. And, by the way, having a car can be very useful if you are on a holiday at the Costa del Sol. Just imagine. After having a homemade breakfast on the terrace of your holiday home, you have an exploring trip through the Costa del Sol. First, you pass some of the limed white houses. Later on, you go through the maze of ways of the green hills. After half an hour, it’s time for action! Your quad safari is just about to begin. On the way back, you stop at the water park to refresh. And, when you go back to your villa, have a nice barbecue. Sun, beach or winter holiday, during the whole year the Costa del Sol is an amazing area. Of course, you can book a hotel, but having a holiday home is always the best! If you book a villa the chance will be big that you have a private swimming pool! If you have your own holiday home you can do whatever you want. Which is obviously great! So, when are you going to book your holiday home on the Costa del Sol?